After leaving the Highlander at a deep, long, and intimidating stream crossing we followed the road as it turned into an ATV trail, then into a creek that ATVs sometimes drove up. 5 miles after leaving the car we left the wide valley and hiked up towards the pass to our right. As soon as we were out of sight of the road, caribou started to appear around us. I still have not come to terms with the fact that caribou seem to prefer to stand broadside to humans. These particular animals probably knew that our ultralight backpacks couldn't fit a quartered caribou. Over the first pass the Alaska Range came into view. Framed by red tundra in the foreground, the steep glaciated peaks were so sharp in the fall air. From there we worked our way northeast thru a series of shallow valleys and ridges. 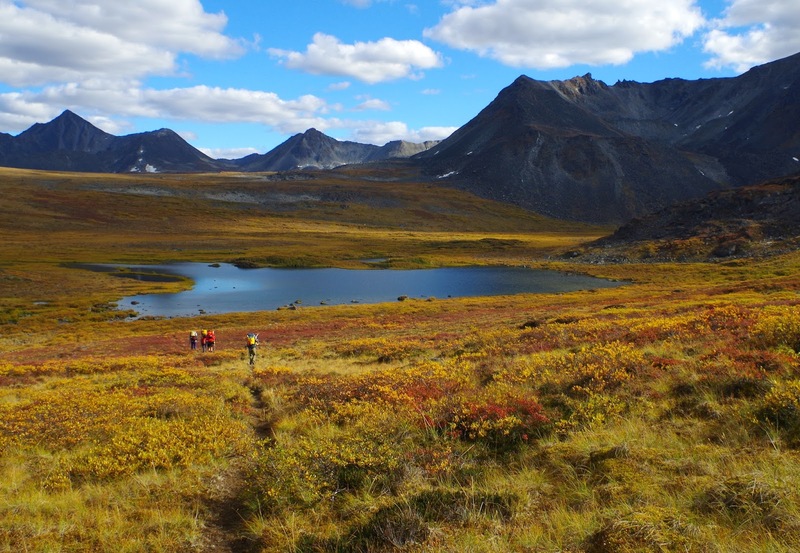 Each ridge would bring a new view of the Alaska Range behind miles of tundra colors. Around each corner would be a flock of opinionated ptarmigan or a family group of caribou. Thru the valleys we used caribou trails followed by countless generations of animals. Sometimes the trails were so trafficked they'd been beaten a foot below ground level. Sometimes they were three lane highways. 18 miles into the day we stopped to set up camp at a tarn. As we went to bed a group of caribou peacefully ate dinner around us. With another long day ahead, Andalyn had us up and at em. The program was the same: follow a caribou highway until it evaporates into the bushes, stand awestruck by the scenery, repeat. We ate lunch at a broad pass looking into the heart of the big mountains. A large group of caribou were as interested in us as we were in them. They'd run towards us, get scared, run away, then change their minds and come back over. Following caribou superhighways, we passed craters the size of washing machines from brown bears bulldozing after ground squirrels. One last pass and we were looking down on the East Fork Susitna Glacier. By 5 PM we were making good time down the river. In the upper reaches it was just deep enough to not scrape and straight enough to not add too many extra miles of winding bends. With 25 miles of paddling and 6 hours of driving left we were on the river early the next day. This section was frustrating. Long sections were too shallow to paddle and we were forced to drag our boats thru knee deep glacial silt. We'd stop briefly for snacks only to retreat quickly out of the wind into the relative warmth of our boats. 4 miles before the bridge Andalyn and I got out and started running back up the road towards the car. Before long a wonderful miner gave us a ride all the while telling us where the grayling honey holes were in her tailings ponds. This trip is one of the most beautiful places I've ever been. The hiking was on perfect game trails surrounded by wild animals and framed by huge peaks. The float was a slog. If its not forecast to be clear enough to get views of the Alaska Range then wait til it is!